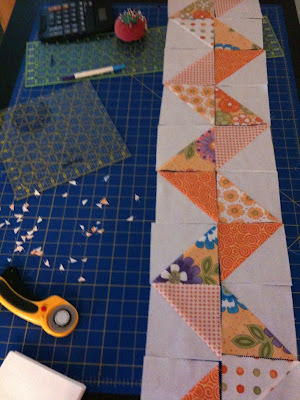 Inspired by the beautiful zig-zag quilt over at Red Pepper Quilts, I started on a zig-zag quilt this afternoon. I'm using Clementine charm packs and I'll have alternating rows of pink, orange, blue, and purple. It actually goes much faster than I imagined. I can't wait to make a quilt with lots of white! I love the contrast. I received yards and yards of fabric in the mail last week after deciding that I needed to get my hands on some of my favorites before they are gone. I'll post some pictures later. I'm still trying to decide what to do with all of it! I want to do a zig-zag, a whirly pinwheel, and a string quilt. And, I ordered some FOE (fold-over-elastic) to make skirts, so I'm anxiously awaiting it's arrival too!